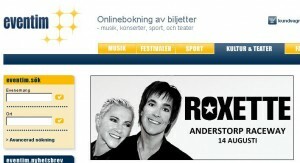 According to TheRaceLegends.com, Eventim.se became a new reseller of Roxette concert tickets. The tickets will be released on Tuesday, February 16th at 10.00 AM and will be sold through Eventim.se, LiveNation.se, Eventim call center 0046 771 651 000 and all Eventim agents in Sweden. The Daily Roxette also informs that there is no need to worry – Biljettnu.se tickets are still valid.